Side Dish of MS: Post Secrets! Last night my roommates and I attended a Post Secret event. 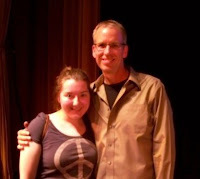 I mention Post Secrets a few weeks ago but the chance came up to go to a Post Secret event at a local university. We all bought tickets and went last night. It was a really nice event, Frank (the creator) shared his insights and the background of the project. We got to meet Frank, got his autograph and a picture with him! It was a fun night. We met up with two of our friends at the event and went for milkshakes and fries at a local diner afterward. Thanks to everyones comments from yesterdays post...it gave me the little push I needed to go! Of course I will definitely blog afterward!